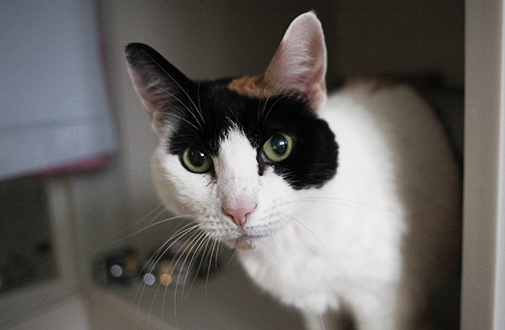 Looking for more information about how to structure your kitten, adult cat or senior cat’s diet? 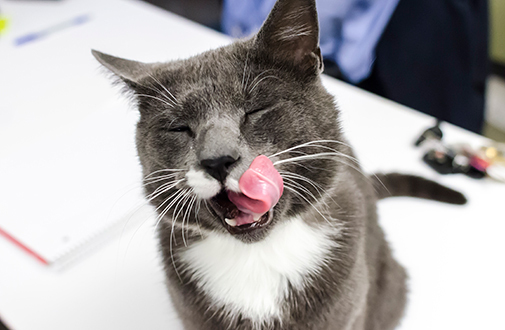 Read on for important nutrition tips to help keep your feline friend healthy. Nutrients are substances obtained from food and used by an animal as a source of energy and as part of the metabolic machinery necessary for maintenance and growth. Barring any special needs, illness-related deficiencies or instructions from your vet, your pets should be able to get all the nutrients they need from high-quality commercial pet foods, which are formulated with these special standards in mind. Here are the six essential classes of nutrients fundamental for healthy living. Water is the most important nutrient. While food may help meet some of your pet's water needs, pets need to have fresh clean water available to them at all times. A deficiency of water can cause serious illness or even death. Proteins are the basic building blocks for cells, tissues, organs, enzymes, hormones and antibodies, and are essential for growth, maintenance, reproduction and repair. Proteins can be obtained from a number of sources. Animal-based proteins have complete amino acid profiles. (Please note: Do not give your pet raw eggs.) Protein is also found in vegetables, cereals and soy, but these are considered incomplete proteins. Essential amino acids cannot be synthesized by the animal in sufficient quantities and MUST be supplied in the diet. Essential amino acids include arginine, methionine, histidine, phenylalanine, isoleucine, threonine, leucine, tryptophan, lysine, valine and taurine*. Non-essential amino acids can be synthesized by your pet and are not needed in the diet. *The essential amino acid taurine is required for companion cats. Taurine is required for the prevention of eye and heart disease, as well as reproduction, fetal growth and survival. This essential amino acid is only found in foods of animal origin, such as meat, eggs and fish. ​Fats are the most concentrated form of food energy, providing your pet with more than twice the energy of proteins or carbohydrates. Fats are essential in the structure of cells and are needed for the production of some hormones. They are required for absorption and utilization of fat-soluble vitamins. Fats provide the body insulation and protection for internal organs. Essential fatty acids must be provided in a pet’s diet because they cannot be synthesized by a cat in sufficient amounts. Linoleic acid is an essential fatty acid for cats. Arachidonic acid, an omega-6 fatty acid, is also essential for cats for the maintenance of the skin and coat, for kidney function and for reproduction. Omega-6 and omega-3 fatty acids play a vital role in healing inflammation. Replacing some omega-6 with omega-3 fatty acids can lessen an inflammatory reaction—whether it is in the skin (due to allergies), the joints (from arthritis), the intestines (from inflammatory bowel disease) or even in the kidneys (from progressive renal failure). Carbohydrates provide energy for the body’s tissues, play a vital role in the health of the intestine, and are likely to be important for reproduction. While there is no minimum carbohydrate requirement, there is a minimum glucose requirement necessary to supply energy to critical organs (i.e. the brain). Fibers are kinds of carbohydrates that modify the mix of the bacterial population in the small intestine, which can help manage chronic diarrhea. For cats to obtain the most benefit from fiber, the fiber source must be moderately fermentable. Foods that are high in fiber are not good for cats with high energy requirements, such as those who are young and growing. Vitamins are catalysts for enzyme reactions. Tiny amounts of vitamins are essential to cats for normal metabolic functioning. Most vitamins cannot be synthesized in the body, and therefore are essential in the diet. When feeding a complete and balanced diet, it is unnecessary to give a vitamin or mineral supplement unless a specific deficiency is diagnosed by a veterinarian. Over supplementation can result in poisoning with some key vitamins and minerals! Minerals are inorganic compounds that are not metabolized and yield no energy. These nutrients cannot be synthesized by animals and must be provided in the diet. In general, minerals are most important as structural constituents of bones and teeth, for maintaining fluid balance and for their involvement in many metabolic reactions. If you’re responsible for taking care of kittens in the first few months of their lives, you should be prepared to move them from a diet of milk to regular kitten food. Read on for tips for making the transition. Newborn kittens receive complete nutrition from their mother’s milk for the first four weeks of life. Mom's milk is perfect for their needs, so you don’t need to feed them anything else. In the event that the mother cat is ill or doesn’t produce enough milk—or if the kittens are found as orphans—it may be necessary to feed the kittens a commercial milk replacer. If you find yourself in this situation, contact your veterinarian for product and feeding recommendations. During the first weeks of life, a kitten’s body weight may double or even triple. This rapid growth will continue, albeit at a decreasing rate, until maturity. Large amounts of energy and nutrients are required in balanced quantities to support this spectacular growth. Kittens need large amounts of energy—about two to three times that of an adult cat. Kittens also need about 30% of their total energy from protein. Make sure the food you offer is specifically formulated for kittens. Your pet will need to eat kitten-formula food until she reaches maturity, at about one year of age. By the time kittens are five to six weeks old, they should be nibbling on a high-quality dry food consistently even though they’re still nursing. This process of gradually introducing kitten food is important in training cats to eat as they are weaned. Most mother cats will suckle their kittens until about eight weeks of age. 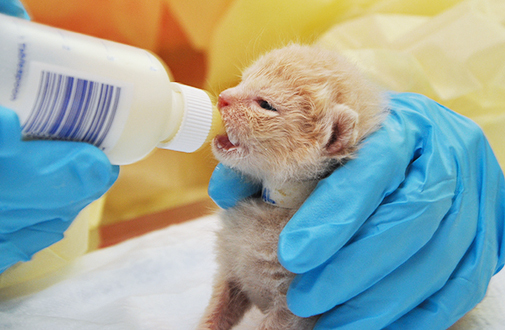 By this time, 80 to 90% of the kitten's total nutrient intake should be from kitten food. Kittens can be fed free-choice—which means food is available at all times, as much as the pet wants, whenever the pet wants. 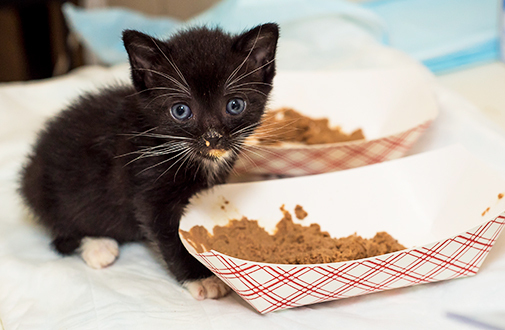 You can feed them dry kitten food or nutrient-dense kitten-formula canned food—however, the free-choice method is most appropriate when feeding dry food, which will not spoil if left out. If you have a dog in your home, make sure he can’t get to the kitten’s food (dogs just adore cat food!). Also, make sure fresh water is available at all times. At first, curious kittens will probably want to play with their food rather than eat it, but the youngsters will soon catch on and realize they are supposed to eat the food, not just bat it around! It’s fine to feed your kitten a few treats. However, treats should make up no more than 5% of your kitten’s daily nutrient intake, and the rest of his/her diet should come from a high-quality kitten food. The process typically takes between four and six weeks, with most kittens completely weaned by the time they’re eight to 10 weeks old. When the kittens reach four weeks old, you can place them in a separate area for a few hours at a time to reduce their dependency on mother’s milk and her overall presence. Put them in their own special area with a litter box and food and water bowls. As the kittens become more independent, they can spend more time away from their mother until they are completely weaned. Serve kitten milk replacer in a shallow bowl. Do not use cow’s milk, as this will cause stomach upset and diarrhea in some kittens. Dip your fingertip (or the syringe or bottle the kitten is used to nursing from) into the liquid, let the kitten lick it, then guide him by moving your finger down into the bowl. Please do not push his nose into the bowl. He may inhale the liquid and develop pneumonia or other lung problems. Once he becomes accustomed to lapping liquids, create a “gruel” mixing a high-quality dry or canned kitten food with kitten milk replacer until it is the consistency of oatmeal. Make a gruel (described above). As the kitten gets accustomed to eating, gradually decrease the amount of milk replacer you add, while slowly increasing the amount of kitten food. By five to six weeks, he should be eating only lightly moistened food. Now you can start to leave out small amounts of dry food and fresh water at all times. By eight to 10 weeks, kittens should be accustomed to eating unmoistened kitten food. Generally, orphaned or hand-fed kittens can begin weaning slightly earlier, at about three weeks of age, but otherwise the process is essentially the same. Begin by offering milk replacer in a dish, teaching the kitten how to lap from the dish. Gradually transition to a gruel (described above). As the kitten slowly grows accustomed to eating, gradually reduce the amount of milk replacer you use. By five to six weeks of age, he should be relying solely on kitten food for his nutrients. Adult cats should eat enough of a high-quality, nutritious food to meet their energy needs and to maintain and repair body tissues. 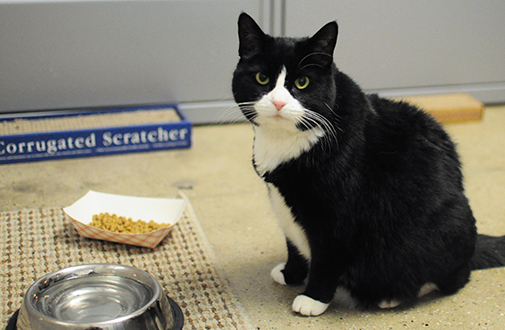 The amount you feed your adult cat should be based on his or her size and energy output. Activity levels vary dramatically between pets and will play an important role in determining caloric intake. A cat with a "normal" activity level should receive what we call "maintenance" energy. A cat who mostly lies around the house may require 10% below maintenance, while an active kitty who plays all day may require maintenance plus 20 to 40%. Your cat should always have free access to fresh, clean water. Water bowls should be cleaned every day. All cats require taurine, an amino acid that is important for normal heart function, vision and reproduction. Since taurine is found only in animal-based protein, all cats need meat-based diets to meet their nutritional requirements. As a general rule of thumb, we recommend that all cats be fed twice daily using the portion control feeding method (see below). Start by dividing the amount suggested on the label of your pet’s food into two meals, spaced eight to twelve hours apart. You may need to adjust portions as you learn your cat’s ideal daily “maintenance” amount. Pet owners should consult with their veterinarians to determine the best feeding schedule and types of foods for their pets. Portion-control feeding entails measuring your pet's food and offering it as a meal, thereby controlling the amount of food that can be consumed. This method is used for weight control programs and for animals who might overeat if fed free-choice. Food can be provided in one or more meals daily. The timed feeding method involves making a portion of food available for the pet to eat for a specified period of time. 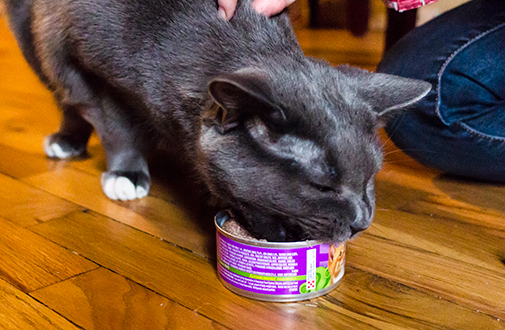 For example, you would place food in your cat’s bowl and allow your pet to nosh for 30 minutes. After that time, whatever food the cat has not eaten is removed. Free-choice feeding is also known as "ad lib" feeding or "free feeding." Food is available at all times, as much as the pet wants, whenever the pet wants. This method is most appropriate when feeding dry food, which will not spoil if left out. 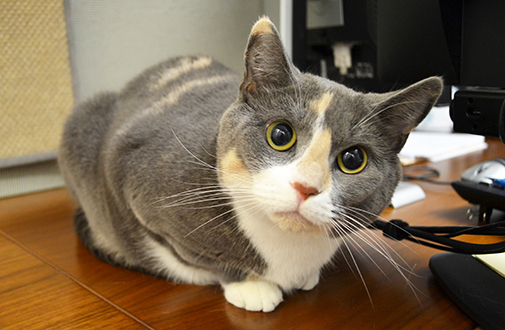 However, some cats will overeat when fed free-choice, which can result in obesity. Milk should not be fed to cats as a treat or a substitute for water. Cats do not possess significant amounts of lactase, the enzyme that breaks down lactose in milk. Feeding milk and milk-based products to cats can actually cause them to vomit or have diarrhea. Treats should be given in moderation and should represent 5% or less of a cat’s daily food intake. The rest should come from a nutritionally complete cat food. Routine care for geriatric pets should involve a consistent daily routine and periodic veterinary examinations to assess the presence or progress of chronic disease. Stressful situations and abrupt changes in daily routines should be avoided. If a drastic change must be made to an older pet's routine, try to minimize stress and to realize the change in a gradual manner. Obesity develops when energy intake exceeds energy requirements. The excess energy is then stored as fat. 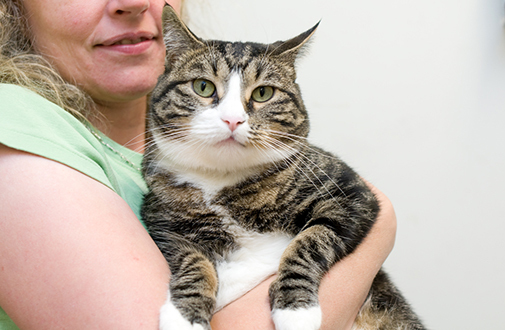 Once a pet is obese, he may remain obese even after excessive caloric intake stops. The majority of cases of obesity are related to simple overfeeding coupled with lack of exercise. As a subjective assessment of body condition, you should be able to feel the backbone and palpate the ribs in an animal of healthy weight. If you cannot feel your pet’s ribs without pressing, there is too much fat. You should also see a noticeable "waist" between the back of the rib cage and the hips when looking at your pet from above. Viewed from the side, there should be a "tuck" in the tummy—the abdomen should go up from the bottom of the rib cage to inside the thighs. Remove the pet from the room when the family eats. Feed your pet several small meals throughout the day. Feed all meals and treats in the pet's bowl only.